In a place where even the picket fences sprout leaves, you just know the soil has to be good. 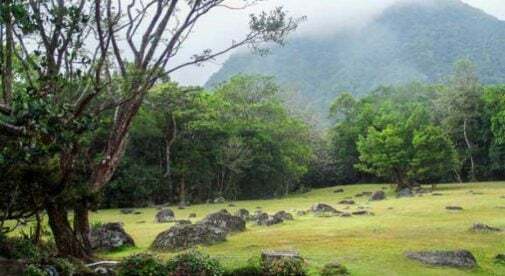 Known as Panama’s fertile valley, the tiny town of El Valle is a world of green. Lushly carpeted mountains surround the flat crater town. The green is punctuated here and there with bright bursts of crepe-like bougainvillea. The tropical reds and oranges almost seem odd in a place this cool and breezy. Thanks to an elevation of about 2,000 feet, El Valle is typically a comfortable 70 F to 80 F, with noontime temperatures rarely above 85 F. At night, a light sweater is all you’ll need. It’s no wonder Panama’s elite have weekend or retirement homes here…and quite a few expats, as well. It’s one of Panama’s most attractive towns, dotted with picturesque gabled cottages and large country estates belonging to a veritable “who’s who” of Panama. 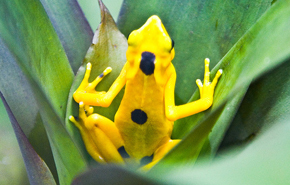 El Valle is one of the last places where you can still see Panama’s iconic golden frog, and the only place in the world to find square trunked trees. The population is only about 8,000 inhabitants, but a small stream of tourists trickles through here. They’re typically outdoorsy types who come for the hiking, hot springs, and famous displays of flora and fauna. Entrepreneurial types have opened up little inns, cafés, and eateries to serve tourists and weekend or holiday crowds. It’s the perfect place for retirees who like the idea of having a bit of extra income without working too hard. There’s high-speed internet, reliable power and water, and everything else you could possibly need. To serve the demands of a growing community, new supermarkets and shops have popped up here and in Coronado beach. Just 40 minutes away by car, Coronado is where you’ll find an upscale clinic, a large El Rey grocery store, and plenty more banks, restaurants, and shops. With a location this good you can have breakfast surrounded by cool mountains in El Valle, head to the beach for an afternoon swim and seafood dinner, then come back for coffee or hot chocolate on your deck. With excellent infrastructure, location, community, and climate, El Valle has a lot to offer.